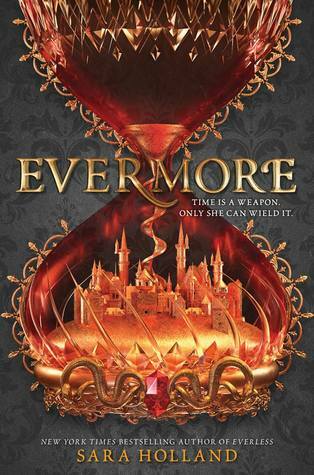 I have been looking forward to reading Evermore for almost an entire year and unfortunately, it didn’t live up to its predecessor. I give Evermore by Sara Holland four out of five hearts because I didn’t like it as much as Everless. I thought it was a little bit of a mess and it was hard to follow at some points. It wasn’t even that I had high hopes for it or anything, but I was looking forward to it. Jules is on the run since the end of Everless. I had some problems remembering what happened in Everless, but this novel actually had little clues to remind you about it. So I was quickly caught up on who was who and what happened. Evermore has plenty of action, which might be why I didn’t like it as much. I would have liked some moments of peace and quiet too. Every time that Jules went through something, the next thing already came knocking and I think she could have done with a little bit less. I liked the relationship between Jules and Ina, but it could have been done better. Just like how for me the entire romance could have been left out of the book and it would have made me like this book even better. Overall I still think Everless is much better than Evermore and I am happy this series is now done. My advice to Sara would be to stick to standalone books, maybe those work better for her.